Home Early childhood education ideas, activities and lesson plans that promote young children's self-esteem and self-identity. This preschool education theme encourages self-awareness and enhances learning about family. At the beginning of a child's preschool experience these activities help ease separation anxiety and during the year they help youngsters cope with the birth of siblings. After looking through this theme remember there's LOTS more Me, My Family and Friends activities in the Rainbow Resource Room. Promote self awareness with this early childhood lesson plan by Patti H.
Materials: Butcher paper, crayons or markers, the child's clothes and scissors. Description: The child lays down on the butcher paper and the teacher traces the child's outline. The child then colors in the face, eyes, nose, ears, hair, what ever they are able to do on their own. If the child is able to cut the outline of them out, if not the teacher does that part. Then another outline is made . The two are than stapled together and stuffed with tissue paper, newspaper whatever you have and then this life size cut out is dressed in the child's clothes. Comments: This activity takes a few days to do. But the children enjoy seeing their cut outs in their own clothes. Family Project: "Me and My Family"
During this early childhood activity Laura G. gives each child the opportunity to share information about their family as well as themselves. Materials: A note sent home to parents. Description: Send a note home to the parents at least 1 week before you plan to begin sharing the posters, pictures, etc. Ask the parents to help their children put together a poster or a collage of family pictures for the children to share with the class. Have each child return their poster or collage to school on a different day to share with the class. Each child gets to stand up in front of the class and tell all about their poster, pictures or collage. They can answer any questions that the other children might have after sharing their information. Comments: This activity was WONDERFUL in helping to create self-esteem and confidence in these young children. They loved getting to stand up in front of the class and telling about their pictures, posters and collages. They liked having the other children ask questions about the pictures and sharing their own thoughts and memories of their pictures. This was a perfect ending activity to our "All About Me and My Family" Unit! This preschool activity by Pamela D. promotes family activities, helps develop language and self-esteem, and helps preschoolers recognize that everyone is different but special in their own way. Materials: Poster board and a note sent home to parents. Description: Trace on a 8 by 10 poster board, a pattern of a person that looks like a gingerbread man. This is a take home activity that the child is to do with his or her parents or family member. Send a note home asking the parents to decorate the doll to make it look like the child. You can use anything you would like. Some suggestions are rice, noodles, ribbon, sprinkles, buttons, crayons, markers, glitter, cereal, or anything in the kitchen. Ask the parent to work WITH the child to decorate the "me doll" and send it back with the child to school. The dolls will be sent home later on in the year. When the child brings back the doll have a special time each day for the child to get up in front of the class with the teacher and tell how they made the doll and with who. Encourage the child to talk but really they love telling how they made it. If after a month you did not get a response from the parent, we will make one in class with the children who still did not have one. That way everyone has a doll and I put them up on a bulletin board with the child's name underneath. The children and parents love to look at these dolls! 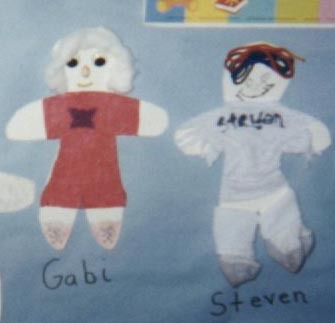 Gayle's Note: Thanks Pamela for sending in a large picture of the "Me Dolls". I'm sorry that I could only post a small portion. 1, 2, 3 You Are Friends With Me Song Rebecca R. shares this preschool activity that uses small motor and counting skills. Materials: Two hands and one's voice. Description: Ask children to sit in a circle facing each other. Next, have them sing this song: Words by Rebecca Ryan melody from the tune of "1,2,3 The Devil's After Me." "1,2,3, you are friends with me. 4,5,6 we make a perfect mix. 7,8,9 we have fun all the time. Shake my hand , shake my hand that's 10!" While singing, have children count on their fingers with the words. On the last line, have the children shake the other children's hands on each side of them. Then have the children show all fingers on both hands to end with "that's 10!" Comments: The children all love this song! They all clap at the end to show their happiness! The Friendship Theme is in the Rainbow Resource Room. For this early childhood lesson plan preschool children will use problem solving, observation, prediction, creative thinking and fine motor skills. Collage and trashable materials such as paper tubes, small boxes, styrofoam pieces, plastic containers, paper / fabric scraps, glue, tape, crayons, markers and pictures of different types of homes all over the world. A good source for pictures is National Geographic Magazine. Teachers, together with a small group of preschool children talk about homes. Tell children about the type of home that you live in and ask them to tell about theirs. Make an experience chart or a graph from the information they share. Ask, "Why do people live in homes? Why can't we live outside all of the time like some animals do?" If possible, share pictures of a variety of homes that are found in the United States (or in your country). Discuss why some homes are different than others. Help youngsters notice that the weather and available materials affect the way homes are built. Next show pictures of homes that are found in other countries. Help children compare and contrast the homes in the pictures with the ones in their neighborhoods (take a look in Outdoor Activities for the lesson "Create a Neighborhood Map"). Ask, "How are these homes the same as the ones where you live?" As you look at the pictures, point out how they differ and talk about which ones youngsters think would "work" in their neighborhoods. Finally, set out the art and trashable materials so preschool children can create their own shelters. Some young children might like to look at the pictures you've gathered while they make their homes. Others may want to create a home all their own. Give youngsters plenty of time for this project. Some may want to set it aside and work on it again the next day. Encourage children to bring in unusual materials from home to add to their buildings. Extensions: Create a display of the preschool children's designs. Then help each child dictate or write about his or her building (using inventive spelling) and place each description nearby. Use a large appliance box and make it into a special kind of home / shelter. The new building can add to the youngster's "house" play in the dramatic play area. For this preschool education activity plan small groups of pre-k children will use cognitive and affective skills in pretend play and improve self management abilities. Role-playing with dolls can help preschoolers cope with separation anxiety. You will need: Dolls representing various races and ethnic backgrounds, doll beds, table and chairs (doll or child sized), play stove and sink, plastic plates and spoons, blankets, pots and pans, and any other items for a housekeeping area for pretend play. In the preschool classroom set up a housekeeping area with the items listed above. Contact parents a day before the activity and request that young children bring a favorite doll, stuffed animal or blanket on the day of the activity. This is an especially good activity for children who are new to your program, as well as those who are new to childcare and being away from their parents. Begin by inviting several children to join you in the housekeeping area. Encourage them to bring their favorite item / doll. Hold a doll yourself and give it a hug. Talk about loving the baby, and role play being a mommy or daddy. You can feed the baby and tell him / her stories, put the baby down for a nap, and even go to the store to buy things for the baby. As preschoolers take care of their babies, talk about what they are doing and how they feel. Encourage them to verbalize as much as possible. Role play Mommy and Daddy going to work etc. Invite children to put their babies in an area with toys and leave the babies there while they go to work. Next, help pre-k children talk about Mommy (Daddy) coming back and getting her/his baby when she is all done at work. Have a snack or go outdoors to play, and while children are away from the babies talk about returning to get babies after the activity. Be sure to say something like, "See, Tommy always comes back, Baby, and gets you just like Tommy's mommy will always come back and get him." Teacher Tips: Remember preschoolers have a difficult time when any important adult leaves them. Some may not be able to part with their baby at the beginning of the school year. For these children the ability to separate from their baby will come later when their anxiety lessens. Patience and understanding are the keys to success. When parents or other relatives return at the end of the day, encourage children to "show and tell" them about the activities they participated in during the day. Encourage preschoolers to take their parents to the classroom areas in which they played. This small group art lesson encourages self-awareness, self-identity, self-esteem and family relationships. During this lesson children will use fine motor and representation skills. Ask preschool children to look in the mirror and describe themselves, "What color is your hair? How many eyes do you have? What color are they?" etc. Describe the clothes that you are wearing and then ask children to describe what they and their classmates are wearing. Next, ask children to draw pictures of themselves (remember that many young children will only be able to manage organized scribbling). Say, "Tell me about your picture" and accept what each child tells you. Label the pictures accordingly (eyes, nose etc.). Some children may want to draw pictures of their families, friend and pets. Let each preschooler help you write his/her name on their individual drawings or, if they can, let them write their own names. Some children will want to take their drawings home others may permit the teacher to put their picture on classroom display. Vary this lesson throughout the year with drawings of relatives, friends, pets, home, neighborhood etc. Save a few examples of each child's drawings from the beginning of their preschool experience and place them in individual children's developmental portfolios. Repeat the lesson a few times during the year and note the development of the children's fine motor and representation skills. One little chin; that's ME, complete! Lots more fingerplays, nursery rhymes and action songs are in the Rhyme Theme About Self and Family.